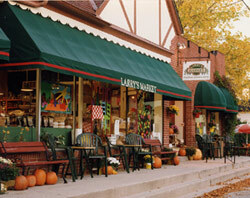 Larry's Market started experimenting with new foods and trends in the early 1960's when Larry Ehlers was an employee of Brown Deer Market and when fresh cut flowers, frozen foods and perishables were not exactly staples in your local grocery store. Larry's fascination with the new and exotic helped turn this established neighborhood business into the first specialty food store in Milwaukee. Today, tracing the 100-year plus history of the Brown Deer shop is like tracing the history of specialty food in Milwaukee, because in a real sense, Larry's Market gave birth to the specialty food market here. The shop maintains its edge in the rapidly growing specialty food business by listening to customers, staying flexible and being open to new ideas.